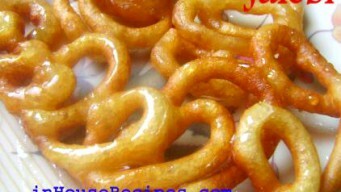 Jalebi recipe with no yeast and no baking powder. Make crispy, juicy and delicious Indian dessert at home easily and quickly with tried and tested recipe. Jalebi is an awesome Indian dessert. A halwai's shop (sweet shop) is not considered complete if he does not sell Jalebi. It has pretty deep roots in Indian culture and you can even find a satirical proverb complimenting the shape of jalebi : "Jalebi ki tarah seedhe" (You are as straight as a Jalebi). I would say that it resembles the straightness of this world!. I too love Jalebi and have grown up eating the street side Jalebi sold on weekly Saturday market. We all know that the street side food in unhygienic but it still has some kind of unusual attraction which we are sometimes not able to resist. We still cherish those memories and pick some whenever we get a chance. My husband too has started liking them from our neighborhood Saturday market! 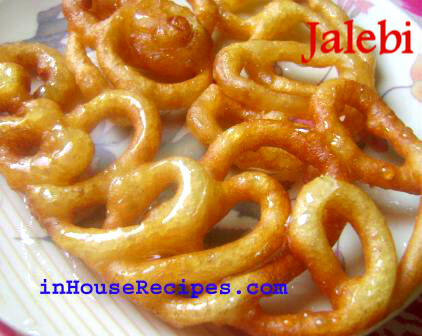 Here, we are presenting an easy and quick way of making jalebi at home. It does not take much resources as you might think. One of the main ingredients to the recipe is sugar syrup (chaashni) whose recipe has not been explained in this video. Add gram flour & all-purpose-flour. Add water gradually and mix well. Batter should be thick as shown in the video. Cover the batter bowl and keep it aside for about 12 hrs for fermentation. After 12 hrs, Batter would have fermented and will be ready to make Jalebi. Transfer the batter in a Zip lock bag or in any instrument which is available with you to make Jalebi. The idea is to hold the batter and release it like a string in hot oil. Normally, the traditional sweet makers use a cotton cloth to hold the batter and release the Jalebi string with a small hole. We are using a zip lock plastic bag to achieve the same result. Mark a cut on one corner of the Zip lock bag. Heat Oil in a pan on high flame. On the other hand, heat the Sugar syrup on low flame. We need to submerge the Jalebi immediately in warm Sugar syrup to make it absorb as much sugar syrup as possible. Once Oil is hot, turn the stove on medium flame for frying Jalebi. Now squeeze the zip lock pouch to extract the Jalebi string directly into the Oil. You need to make quick revolutions of your hand to give it a round shape. Try to keep your hand as low and near to Oil as is comfortable to avoid any Oil flips. Flip it once it is light brown in color from its bottom. Fry till it become light golden brown from both the sides. Once done, take it out from Oil & straight away dip it in the sugar syrup completely. You can even use a spatula to make it stay under sugar syrup. Normally, you would see that Jalebi would come back and flat on Sugar syrup’s surface. We would like to stay it submerged to absorb the syrup. After 2 minutes, take out the jalebi from syrup. Delicious Jalebi is ready to serve hot. Enjoy. You may also want to look at the evergreen Gulab Jamun - the soft, silky and mouth watering indian sweet dish. The recipe is the perfect one to replicate the Gulab Jamun that you get in chandni chowk of Old Delhi. They will simply melt in your mouth.